Welcome to the Capitol Reef National Park Information Page. The closest major airport is Salt Lake City International Airport is 224 miles North of the park. 1. Take I-15 South to Spanish Fork, at Spanish Fork take Highway 89 South to Stateroad 24 South at Sigurd to the Park. 2. Take I-15 South past Nephi, just past Nephi take Stateroad 28 South to Highway 89 South to Stateroad 24 South at Sigurd to the Park. 3. Take I-15 South to Scipio, at Scipio take Highway 50 South to Highway 89 South to Stateroad 24 South to the Park. 1. Take I-70 West to Stateroad 24 South to the Park. 2. Take I-70 West to Stateroad 72 South to Stateroad 24 South to the Park. 1. Take I-15 North to Stateroad 9 or Stateroad 14 or Stateroad 20 to Highway 89 North to Stateroad 62 North to Stateroad 24 South to Torrey to the Park. 2. Take I-80 East to I-216 South to I-15 South and follow 1, 2 or 3 of the From the North directions. 2. Take 89 North to Stateroad 62 North to Stateroad 24 South to Torrey to the Park. Capitol Reef National Park was established 02 Aug 1937 as a national monument by President Franklin D. Roosevelt. It was redesignated a national park in 1971 and increased six times its original size to protect the majority of the Waterpocket Fold. The legislation – “An Act to Establish The Capitol Reef National park in the State of Utah” – became Public Law 92-207 when it was signed by President Nixon on December 18, 1971. Called “Wayne Wonderland” in the 1920s by local boosters Ephraim P. Pectol and Joseph S. Hickman, Capitol Reef National Park comprises 378 square miles of colorful canyons, ridges, buttes, and monoliths. About 75 miles of the long up-thrust called the “Waterpocket Fold”, extending like a rugged spine from Thousand Lake Plateau southward to Lake Powell, is preserved within the park boundary. “Capitol Reef” is the name of an especially rugged and spectacular park of the Waterpocket Fold near the Fremont River. Capitol Reef National Park has 241,904 acres, or 378 square miles. Capitol Reef ranges from 8,255 feet in Upper Cathedral Valley to 3,967 feet in Halls Creek and is located in the heart of “Canyon Country” along Utah Highway 24 (U-24), halfway between Canyonlands and Bryce Canyon National Parks. The majority of park visitors come during May to September and are lowest in December through February. There are a number of facilities accessible to the disabled. The visitor center and it’s restroom facilities are moderately accessible. The restrooms in the picnic grounds and in loop B and C in the Fruita campground are also accessible. The amphitheater programs as well as some of the walks and talks accommodate sensory and mobility impaired individuals. The petroglyphs and schoolhouse along Stateroad 24, as well as portions of the Fremont River Trail are moderately accessible. Ask at the visitor center for more details. Obtain a free permit at the visitor center. If you are planning a backcountry trip, carry maps (available at visitor center). Water is scarce, especially in summer. Waterpockets, seeps and springs are unreliable. Carry all the water you need. One gallon per person per day is recommended. If you use water from backcountry sources, filter or boil to kill Giardia. Explore the park’s backcountry on longer trips. Before leaving for the backcountry, check with a ranger about trail, route, road conditions and weather and water concerns. Many of these trips follow washes or traverse slickrock. A free backcountry permit is required for overnight trips. Maps are highly recommended. A detailed backcountry hiking map is available at the visitor center or can be ordered from Capitol Reef Natural History Association. Obtain a free backcountry permit at the visitor center. Wear appropriate clothing, footwear, sunscreen and a hat. Pack out all trash including garbage and toilet paper. Do Not burn or bury! Bury human waste at least six inches deep and 100 feet from water sources. Stay on maintained trails. When hiking crosscountry walk on slickrock, animal trails or in wash bottoms to avoid stepping in cryptobiotic crust. Climbing on loose talus or steep slickrock is dangerous. Climbing down is harder than climbing up. If you become rimrocked, wait for help, do not attempt to climb down. Collect fire wood or build fires — use portable stoves. Pollute water sources. Carry water away from the source to wash dishes or bathe, strain out food particles and disperse dirty water. Use biodegradable soap. Camp with .5 mile or within sight of roads or trails. In narrow canyons camp as far away from the hiking route as possible and out of sight. Disturb or deface natural features, historic or archaeological sites. Collect items of any kind including rocks, plants, animals or artifacts. Bikes are permitted on the roads only. They are not allowed on trails or back country. Even though bikes are permitted on roads only, bikers can get away from crowds and automobile traffic by traveling dirt roads in the park. A free biking handout is available at the visitor center and a ranger can help you choose the most appropriate ride for your time, interests and ability. Camping is allowed in campgrounds and in the backcountry with a free permit. Campfires and gathering of fire wood are not permitted in Capitol Reef National Park. Charcoal or camp stoves are recommended for cooking. Traditionally, Capitol Reef National Park has experienced minimal use by technical rock climbers. However, recent years have seen an increase in climbing in Utah’s canyon country. Fishing is permitted in the Fremont River with a valid Utah fishing license which is available in nearby communities. 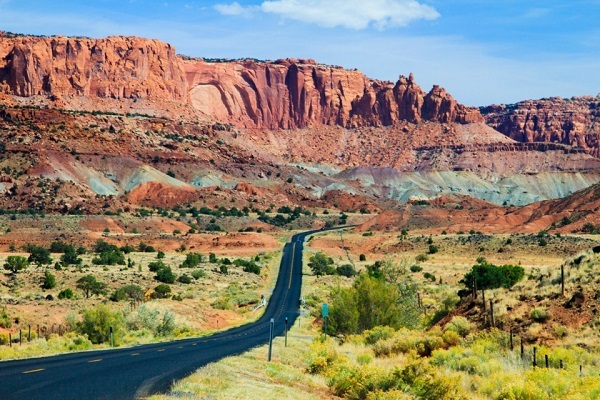 There are no restaurants or snack bars in Capitol Reef National Park. Gasoline, food and limited supplies available and all services are available in the local communities listed below. Short day hikes in and around Fruita give hikers an intimate look at Capitol Reef. Several hikes are self-guided with brochures available at trailheads or the visitor center. Capitol Reef’s trails cover a wide variety of terrain. They wind through narrow canyons, lead to natural arches and bridges and climb to overlooks. Trails vary from easy strolls through the historic orchards and along the Fremont River to strenuous climbs 1,000 feet above the Fremont River Valley. Horse and pack stock use is considered a valid means of viewing and experiencing Capitol Reef National Park. Animals designated as “pack animals” are limited to horses, burros, and mules. Stock use in any part of the park may be prohibited when, at the discretion of the superintendent, such action is necessary to protect park resources or visitors. Lodging in Capitol Reef National Park consists of the three campgrounds: Fruita, Cathedral Valley and Cedar Mesa. All campgrounds are open year round (with some restrictions depending on vehicle clearance and road conditions into Cathedral Valley and Cedar Mesa), and operate on a first come first serve basis. Pets are allowed, on a leash, in the developed areas of the park — along the Scenic Drive, and in the picnic areas and campgrounds. They are not permitted on trails, in public buildings or anywhere off established roads. There are no kennels in the park and pets may not be left unattended in the campground or in vehicles. Consider your plans very carefully before bringing your pet with you. You may walk your pet in the campground, picnic areas, orchards and along the roads. Pets must be leashed (six foot or less in length) at all times. Pets may not be left unattended at trail head, campsites or any other location. Picnic areas are located by the Visitor Center and on the Burr Trail. Swimming and wading is permitted in the Fremont River. Dangerous undertows have caused near fatal accidents — caution should be used when swimming near the waterfall on Stateroad 24. Available Facilities : A small museum and bookstore. Orientation program are available. Travel, weather, road and trail conditions as well as backcountry information is available. Golden Age, Eagle and Access passports are also available. In Jul and Aug, high temperatures usually range five degrees Fahrenheit on either side of the average monthly high shown. Other months vary ten degrees Fahrenheit on either side of the average monthly high. Usually range about ten degrees Fahrenheit on either side of the average low temperatures shown for Jan through Dec. From May through Oct lows range five degrees Fahrenheit on either side of the average monthly low. Days are warming up and hiking can be comfortable with a light sweater or long sleeve shirt. There is a chance of rain. Dirt roads can be muddy and passable to 4-wheel drive vehicles only. Easter is typically a busy weekend. Come prepared with sun screen, a hat and extra water. Although temperatures seldom reach above 100° F (37° C), mid-day hiking should be done in moderation. Gnats can be an annoyance from late spring to early fall. Roads can be washboarded but are usually passable with a 2-wheeled drive vehicle. Fruit harvesting generally begins in June and continues through October. Park use declines in October, but the campgrounds may still fill by early afternoon through the month. During the late summer and fall, Capitol Reef receives half of its annual precipitation in the form of thundershowers. Be aware that narrow canyons are especially susceptible to flash flooding. The landscape is occasionally covered with a light blanket of snow. Slick clay roads are difficult to travel even with 4-wheel drive. Visitation slows markedly, although the campground remains open all year.